This annual event supports our non-profit company and allows us to produce quality children’s theater that is accessible to everyone. Each year we discount and donate thousands of tickets for schools and families who cannot afford to attend live theater. Thank you for supporting Chicago Kids Company. Because of your generosity, young people all across the city will continue to experience the magic of live theater! Please join us for our 2019 Annual Fundraiser. The event takes place on Saturday, February 2 from 6-10pm at the Stahl Family Theater (5900 W. Belmont Ave., Chicago, IL. 60634). Grab your friends and reserve a Team Table! Have some fun while you’re at it: pick a theme, dress up, and decorate your table. Prizes will be awarded for Best Table Theme AND cash prizes will be awarded to the top 3 teams in the Trivia Contest! We have some truly amazing items in our Silent Auction! Click the links below to find out more about the generous organizations and companies that have donated to support children’s theater. 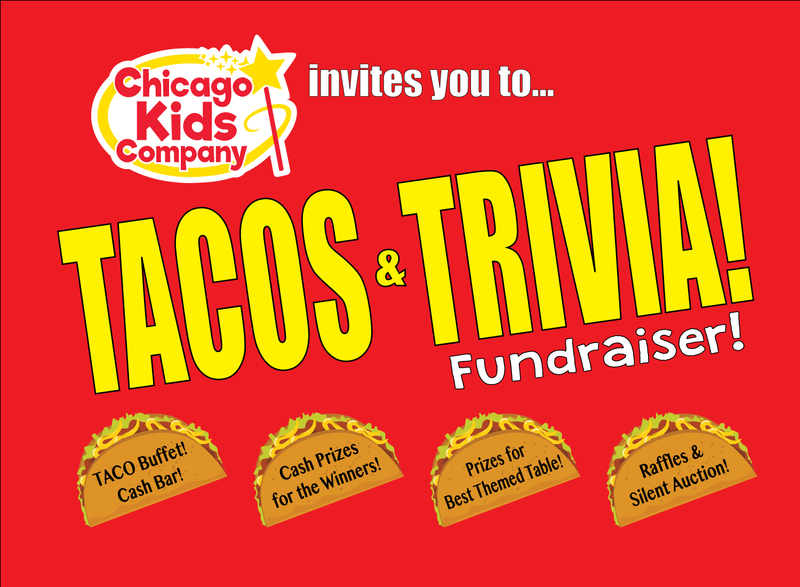 CKC’s Tacos and Trivia Night will include a Taco Dinner Buffet, Cash Bar, Door Prizes, a Silent Auction, a Table Theme Contest, and a Trivia Contest with prizes for the top three teams. Dinner will be served from 6-7pm. The Trivia Contest begins at 7pm.